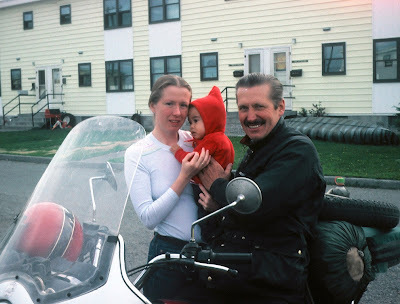 Day 1 - I left home alone at noon, as usual, on Memorial Day, May 25th, 1981, and headed due north for Montreal. I chose a totally different route this time. The odometer reading of 52,000 miles on my well-worn Suzuki GS750 included my Rookie Tour four years earlier, and two additional trips to California. It was 80° and humid when I pulled into my first gas stop, near Warrensburg in the Adirondacks. I realized early that, like with my first trip, I had loaded far too much gear on the back seat and rear luggage carrier. This time there was even more, which made the front end of the bike far too light. Handling on loose surfaces was worse than ever. Although I did expect the problem, I couldn’t find a better way to pack the gear and still be able to move around on the seat. A huge tank bag and oversized saddlebags would have offered much better weight distribution, but a tank bag would have restricted my movements, and I figured that mounting saddlebags would have been far too costly for my self-imposed frugal budget. The load this time consisted of a tent, a sleeping bag, a fairly large suitcase, extra tools and a spare tire. Most of the heaviest gear was loaded on the rear seat, and some of the tools were in the fairing, but far too much was also piled onto the luggage carrier, which was too far behind the rear axle. The front end of the bike raised an inch off the ground as I left my first gas stop with only a normal throttle application, which gave me a clue on what I was in for. I met the first of several rain showers that afternoon between Tupper Lake and Plattsburg, a few of which were downpours. As I approached Montreal clocking a steady 70, almost every car on the road flew by me. I got lost three times in the urban sprawl of the city before finally locating Rte 117. I ate at a Mickey D’s in the city before heading into the Laurentians where it rained steady for about two hours. The Laurentians are not very tall mountains. It was a scenic ride that reminded me of the Catskills. I stopped for the day at a small motel near Labelle, Quebec shortly after 9 PM, having clocked about 400 miles on my first half-day. When I asked about the security of the bike, the motel owner said I should use his garage for the night because the bike would probably not be safe out front. With the garage space included, the room cost only $14. Day 2 - I eased the bike out of the garage at 6:30, trying not to wake anyone. I stopped for breakfast a few miles up the road where the waitress spoke very little English. She blushed a lot, dropped a few things, and seemed nervous about waiting on an old guy with a motorcycle who didn't speak her language, which was French. It rained lightly and was quite cool as I maneuvered through the sweeping turns and rolling hills north of Labelle. The flora consisted mainly of pine trees, hemlocks and a few white birches. The area reminded me a little of New Hampshire, with the same kinds of trees and two-lane macadam roads. Most people I met, struggled with English, or they spoke only French. Near Mont-Laurier I dug into my bag for extra clothes. I was already wearing my heavy Belstaff waxed-cotton enduro jacket over a few layers of sweatshirts. As the temperature dropped below 50°, it was becoming increasingly clear that I hadn't packed enough warm clothes this time either, especially for this northern route, and I thought perhaps for the entire trip. The deep potholes in the first of several construction areas jarred my teeth and made me wonder about the strength of the rear luggage carrier. All of the above contributed to a wicked headache, for which I stopped and dug into the bag again - this time for aspirin. I passed an accident where a lumber truck had overturned in a ditch. It must have had at least 28 wheels, and all of them were topside, facing up. I noticed that most places in Quebec fly their separatist flag rather than the Canadian Maple Leaf. The flag is light blue with a white cross in the center and small figures in the corners that made me think of the Boy Scout emblem. I saw the same flag in many places, including in front of commercial establishments like restaurants. The sun popped out occasionally, but it was mostly overcast and cold. The wind picked up near Val-d'or, and it began to rain. I stopped for gas at a Shell station where the girl cashier didn't speak a word of English. Around 4:00 I stopped for the night near Iroquois Falls when I simply couldn't stand the cold any more. I was wet under my rain suit, and my feet were wet inside my shoes. My toes hurt constantly from the cold. 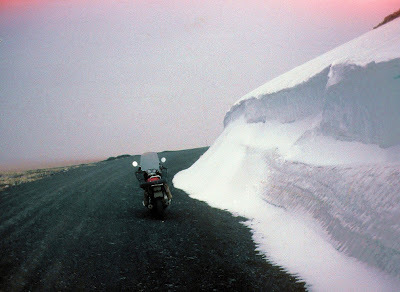 I kept thinking that this idea of taking the northern route during late May was not too bright, because I was already cold to the bone, and I had barely started the trip. Day 3 - I parked the bike directly outside the motel window, and very close to the building, hoping to make it as secure as possible. I still lost my only pair of sunglasses that I accidentally left in a case that was taped to the handlebars. I was getting a very unfavorable impression of Quebec. The temperature was in the high twenties when I left the motel at 6:00. I had to scrape a thick layer of frost from the seat before riding about 70 miles in search of breakfast. From the time I entered Canada, I also kept looking for a bank or a place to exchange currency. The premium on US dollars should have been around 20% in my favor, but when places took cash for my gas or food, they usually did it on an even-money basis, thus charging me that extra 20%, which seemed to be more-so in Quebec, because I didn't have that problem on my first trip. I used credit cards wherever I could, but most small restaurants along the route that I chose didn’t accept plastic. The sun was out by midmorning, although the temperature was still in the mid-to-low 40s with a biting wind coming in from James Bay. I was already wearing just about everything I brought with me, and I wasn't even close to the Northwest Territories where I knew it would be much colder. Of course I could always stop and buy a few extra sweatshirts along the way. I was also wearing a lightweight coverall, which I carried mainly for the dusty roads. I slipped my rain suit booties over my gloves to avoid digging for my big Harley mittens, which were packed too deep inside one of the bags. I found a mailbox later in Kapuskasing, Ontario and dropped a card to Donna about my ETA in Anchorage. The cold eased up around Hearst, where I removed the duster and the balaclava. The terrain was generally flat, with short cedars, poplars and balsams. Most of the farms were small, and looked quite poor. Not much was planted, but of course it was still early in the season. Most of the highways were narrow. Whenever I met huge trucks coming in the opposite direction, with both of us traveling at 70 mph or more, I had to hold on tight because the wind spilling from the truck's front-end would sometimes throw me a foot or more off course. I stopped every 150 miles to oil the chain. Sometimes I would have to go 10 to 15 miles to find a place where I could put the bike on the center stand. The shoulders of the road were too narrow and slanted, and the traffic lanes were too hazardous. I would look for a bridge with a level space between the travel lane and the outer railing, or a culvert that I could get down into and back out of without too much difficulty. That's also how I parked for photos. I didn't take many photos that day. I went on reserve gas in only 129 miles. It was the worst gas mileage so far on the trip, which I figured was probably because of the strong headwinds. I thought it also could have been from the condition of the plugs and points, or perhaps the different fuel mixture. The price of gas in the area was 50% higher than in the US. At one station, the pump stopped with the price between two numbers. The girl read it as $8.60 instead of $6.60. I had to argue with her before finally convincing her that she was reading the gauge wrong. She didn't speak much English. I eventually located a bank in Longlac, Ontario where I exchanged currency and got 18.5%, which was at least better than the even money. Western Ontario looked to me like one huge forest. The flora consisted mainly of small balsams, cedars and poplars, the growth of which might be stunted from the colder climate, or maybe poor soil. I stopped 50 miles before Thunder Bay to dress the ignition points. It was a good move because a huge lump had built up on one of the points, and there was a hole burned into the other, which probably contributed to the poor gas mileage. The sun was shining around Thunder Bay where the temperature was up to 60°. The relative warmth felt good for a change. I took a wrong turn leaving Thunder Bay that took me south toward International Falls, MN. I didn't realize it until after I had gone through 30 miles of rough road construction where the bike handled very poorly in the soft dirt. I struggled with it for the entire 30 miles. After checking my map and learning of my error, I decided to continue on that route in spite of it taking me about 100 miles out of my way. I figured it was better than going all the way back through the construction. There were rock outcroppings on both sides of the two-lane road, some of which were light-colored and looked like granite, while the other was black, and looked like lava rock. The road surface was coarse and rough, which made the tires roar, which I figured was probably causing extra tire wear. 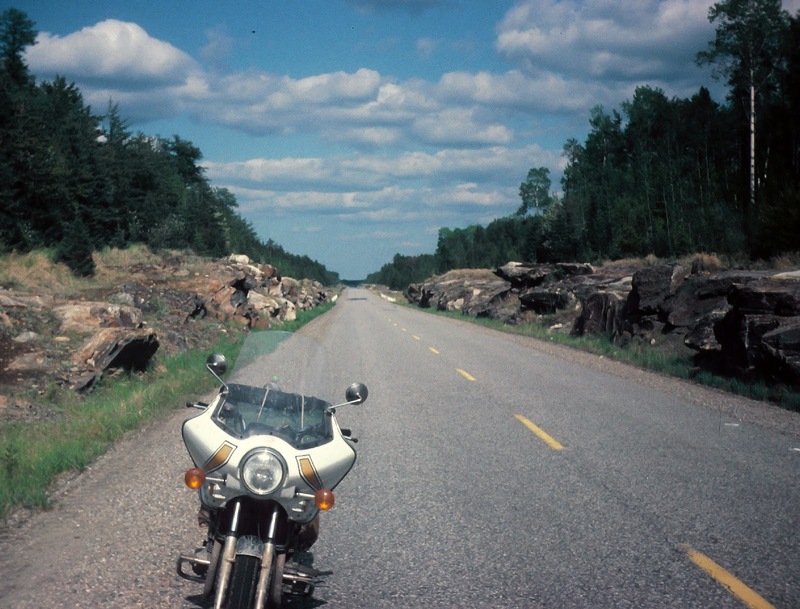 I stopped for the night in Emo, just west of Fort Frances, after 750 miles of two-lane roads that day. Day 4 - When I left the motel, it looked like it would be a nice day with temperatures in the low 50s. I hurt all over from the first three days and it was becoming much more difficult for me to get out of bed in the morning - and I haven't even used the tent yet. The pain reminded me of starting a second day at a Jack Pine enduro. I was constantly aware of pain somewhere in my body, mostly between my shoulder blades. Some of the area just north of Emo looked like an attractive vacation spot with its many lakes and nice scenery. I saw a seaplane take off from one of the lakes. In contrast, I also saw a few small Indian villages that looked very poor and rundown. Rte 71, which eventually led me back to my planned route, was a great bike road with sweeping turns. A short while later I picked up Trans Canada One (TC-1) in Manitoba. The sun broke through around 9:30. I noticed while oiling the chain that the countershaft sprocket was badly worn. Too bad I didn't notice it before leaving. I hoped to get a replacement along my route during the next few days. Thirty miles before Winnipeg, I emerged from the forests onto the open prairie. I put on the my rain suit when it started to rain, but a few minutes later the sun came out again, so I took it off. I stopped at a McDonald’s for a midmorning snack, although I also snacked on peanuts while I was moving. I could put both feet up on the highway pegs and hold the jar between my knees to remove the cap. I could then pour the peanuts into my mouth from the jar as I rode. I couldn't possibly take both hands off the handlebars at the same time because the front end of the bike would immediately start to wobble and shimmy, no matter what the speed, due mainly to the huge load behind the rear axle. The soil in the farmlands west of Winnipeg looked almost black, like pure loam. I wondered what could have made it that way. West of Portage la Prairie I turned northwest on Rte 16. While oiling the chain a short time later, I realized that the new Michelin rear tire I mounted for the trip was showing significant wear. The coarse Canadian road surfaces seemed to be taking their toll. I was gradually climbing to higher altitudes as I rode through some gently rolling hills around Neepawa, Manitoba. I saw mostly wheat fields and cattle farms with farmhouses miles apart. About every ten miles or so, I would pass through a tiny village with a few grain elevators, a few houses, and a garage for repairing tractors. I entered Saskatchewan just ahead of a heavy rainsquall. A short while later I met another extremely heavy squall with 40 and 50 mph crosswinds and hail, followed by a torrential downpour. The wind almost blew me off the machine, and the hailstones stung my face like bullets. The rain lasted only about five minutes, but there were constant crosswinds of 40 and 50 mph on the open prairie. I occasionally had to find a sheltered spot to stop and rest from it. A cluster of trees around a farmhouse would serve as the best haven from the unrelenting winds. I could see squalls coming for miles across the prairie. Sometimes the brightest spot in the sky was straight ahead, so I often traveled as fast as I dared in pursuit of it. A hundred miles east of Saskatoon, I rode through the heaviest downpour of the day, accompanied by fierce thunder and lightning. A gas station attendant said they were the first good rains of their spring season. What a difference from my first trip when good weather seemed to follow me wherever I went. It didn’t seem like a good omen for a trip on which I hoped to use my tent a lot. I checked into a motel in Saskatoon after 730 miles of almost all two-lane macadam, in and out of the heavy rain squalls. Day 5 - I ate a light breakfast of oatmeal cookies, milk and prunes in my room, all of which I was carrying. I oiled and greased the chain and dressed the points before leaving at 6:40. I spoke with a guy at the motel loading a Chevy Blazer who was headed for Fairbanks. He said, "I saw you out there yesterday. Man, you must have gotten soaked!" I told him I had never ridden in a storm that heavy for that long in my life. Ten miles out of Saskatoon I saw a sign, “Slow down and save your windshield.” The road was torn up and covered with heavy loose gravel. Later, on a hard-surface road, a guy riding a Yamaha 750 SECA came up alongside and said he had three hours to get to work, and he was running late. He was traveling a steady 80 mph or better. I watched him as he gradually faded into the horizon. The terrain west of Saskatoon consists mainly of gently rolling farmland as far as I could see in all directions. I stopped at a McDonald’s in North Brattleford for a midmorning snack. It was overcast and I was cold, and I just couldn't pass up the warmth of a Mickey D's. It rained lightly a few times during the morning, and I could see showers in the distance. My gas mileage had gotten so bad that I was constantly looking for a cycle shop to get a new set of spark plugs. I could tell that my strength was also waning when it got more difficult every day to get the bike onto the center stand to oil the chain. Part of that was due to tire wear. The more it wore, the higher I had to lift the bike to get it on the stand. I usually looked for a sheltered area for oiling the chain because the wind would blow the oil away before it could reach the chain. I eventually located a Suzuki dealer in Lloydminster, Alberta where I bought four spark plugs and a countershaft sprocket. I installed the plugs in the shop's parking lot and stowed the sprocket for later. Two of the four plugs had cracked porcelain, maybe from the gas. The bike ran much better with the new plugs. Several deer ran across the highway in front of me shortly after I entered Alberta. The speed limit through most of the towns was 35 or 40 mph. Most of the smaller towns had two or three grain elevators. The larger towns would have four or more. Sometimes I would ride for hours without seeing a police car. I almost never saw the Mounties. Cattle farms became more prevalent in the rolling hills of Alberta. I picked up a deli sandwich and soda, and I found a small picnic area to sit and eat where an elderly couple was also having their lunch. It was clear and 65°, the nicest weather I had seen so far on the trip, although it was short-lived. Sixty miles east of Edmonton I rode through a town called Vegreville where I saw several Ukrainian churches. I saw similar churches in some of the towns on the prairie, and I saw a small cemetery in the median of a divided highway near there. A guy in a car pulled up alongside at a light in Edmonton and pointed to the engine of my bike. He said I was leaking something. After stopping, I noticed the #1 carburetor float was stuck, and gas was coming from the overflow tube. The end of the tube was swollen, indicating that it had been leaking for a while. After rapping the bowl to get the float valve to fall back into place, I pulled the tube out to the side so I could keep an eye on it. The gas in Edmonton cost 25 cents a liter, less than half what I paid in Quebec. 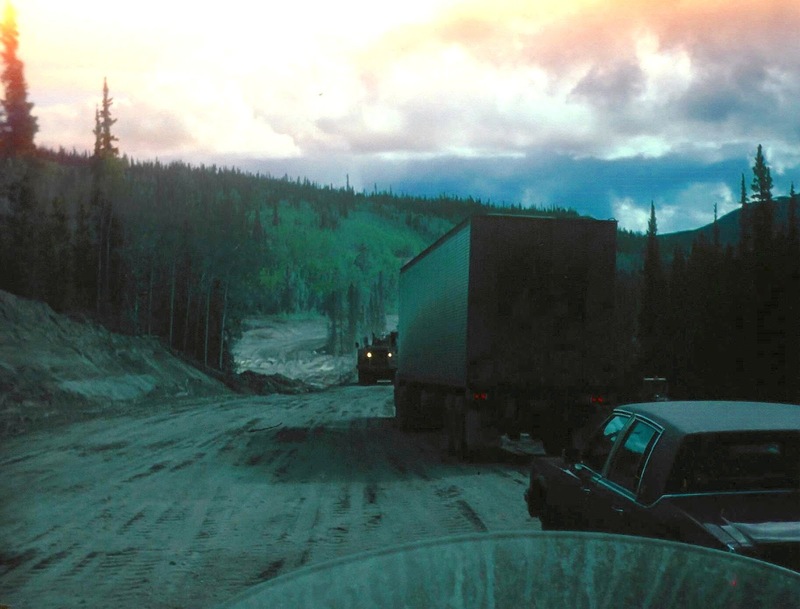 Most of the approach to the Alaska Highway between Edmonton and Dawson Creek (Rte 43) was paved, except for one rough, dusty stretch under construction. My gas mileage seemed to recover a little after I gassed up in Edmonton. There were many natural-gas fields in Alberta, and I occasionally saw pump-jacks rocking in the fields, pumping oil. I stopped in Grande Prairie for dinner after getting lost twice from the poor route markings in town, and also from my poor eyesight. I ate at a KFC and sat near a window with the sun streaming in, which made me sweat in my full riding clothes. It was 7:40, but the sun was still high in the sky, so I continued to ride toward Dawson Creek, hoping to find a campground along the way. My face was getting badly burned from the weather, and I was tired from constantly fighting for control. Day 6 - I didn't sleep well. It was my first night to use the tent on this trip. People were talking, laughing and singing until almost 3 AM. The thin sides of the tent didn't block out any of the sounds. I got up at 5:30, and it took a little less than two hours to roll up everything, tie it to the bike, make some breakfast, eat, and leave. During that time I talked with a guy who worked for one of the Canadian oil companies. He shed some light on at least one of my problems. He said most regular gas in Saskatchewan is only about 81 octane, and it has no real cleansing additives. He said it gums up most engines, and makes a mess of most carburetors. He was sure it was the cause of my poor gas mileage, my sticking float, and my cracked spark plugs. If I had known earlier, I would have looked for high-test gas in Saskatchewan, although high-test is not available at most gas stations on the prairie, especially along the two-lane roads in farm country. The official Mile Zero of the Alaska Highway is in Dawson Creek, BC. I went over the long, narrow steel-deck bridge across the Peace River, which is typical of all the bridges on the Alaska Highway. I got white knuckles as I clung tight to the handlebars from the deep grooves. That part of the Alaska Highway has mostly long hills and wide, sweeping curves. The temperature was in the mid 50s when I stopped at Fort St. John for a ham and egg breakfast. The highway was mostly gravel with a lot of soft spots where I struggled a lot. Fresh puddles from a recent shower were in the road around Pink Mountain. Twenty miles farther, I ran into more rain, and the road surface got much rougher from there, especially in the hilly terrain and on the steep grades where washouts were common. Most of the highway was built on high ground where I could sometimes see the road on the next mountain, far across the valleys. I almost dropped the bike once when I stopped to take a photo. The views of the far-off mountaintops covered with snow was so striking that it brought tears to my eyes. A group from Ontario that I spoke with at one of the lookout points shared my wonderment. One guy said he remembers that the road was in much better shape when he came through 13 years earlier. I assumed there was much less traffic to chew it up at that time, in the mid 1960s. I saw about a dozen horses running loose that appeared to be wild, but they probably belonged to outfitters who rent them out for mining and backwoods expeditions. A few miles farther on, I saw another group of horses, and I also saw the sun for a change. Near mile 230 I spotted a caribou and a third group of horses, some of which had brands. 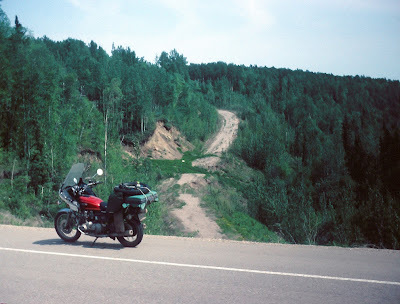 I rode for a while on a rough macadam surface with huge potholes, but mostly the highway was all gravel and dirt. Occasionally there would be a stretch of new blacktop, but tar road in good condition on the Alaska Highway at that time was scarce. The temperature was in the low sixties when I saw a guy near Mile 250 on a fully-loaded travel bicycle. What a way to travel to Alaska! I occasionally saw signs of the original Alcan Highway, which was a single lane of wheel ruts through the thick woods. I also occasionally saw signs of a natural gas pipeline. I was riding across some tooth-jarring bumps near Fort Nelson when a stone from a truck coming the other way hit the top of my helmet so hard it made my ears ring. I even felt a little dizzy from it. I learned to duck whenever I met oncoming vehicles. At another spot, a big rock hit my arm and gave me a Charley-horse. An old guy in a pickup camper, chewing on a cigar, didn't see me coming from behind, and as I was passing him when he suddenly swerved left to miss a pothole and almost ran me off the road. There was one eight-mile stretch of road construction where deep gravel covered the entire road. I was showered with rocks from vehicles coming the other way. I dropped the bike at a photo-op when I misjudged the balance point while putting the bike on the side stand. The balance point changes as the tires wear. I fell downhill with the bike above me. I got out from under it okay, but when I tried to pick it up, I couldn't lift it with all of the luggage tied on. I had to quickly untie everything as gas poured out of the tank vent and the carburetors. Part of my problem was my waning strength from lack of sleep at the noisy campsite the night before. I was totally exhausted. A short while later, I stopped for another photo-op and dug into my bag for a snack and some water to drink. I got to Steamboat Mountain with only about six miles of gas left in reserve. Gas was scarce in that area. I had planned each of my gas stops. The attendant at one station asked what part of New York I was from. When I said Buchanan, he answered that at the age of 18, and with only three days on a job working for Con Edison, he did the calculations for inserting the uranium rods into the atomic reactor at Indian Point, which is two miles from my home. He said now he wants to be as far away from Buchanan as he can get. When I told him I was headed for the Dempster Highway he offered a few bits of information about road conditions. Mainly, he said I should probably carry two spare tires rather than just one, and that I better have spare tubes and a well-stocked tire repair kit because of the sharp shale on the Dempster Highway. Summit Lake was still covered with ice. I saw a motorcyclist coming the other way who was wearing his full rain suit, and I saw a Rocky Mountain goat with young. At Muncho Lake, which is one of the most beautiful spots along the Alaska Highway, the road runs along the edge of the lake for several miles. After the truckers and RVs stop for the night between 5:00 and 6:00, I would ride for a few more hours without seeing anyone. Most campers also stopped early. A porcupine crossed the road right in front of me. I saw a second porcupine later and also chased another group of horses down the road. A few of the horses had brands behind their ears. At one point I swerved to miss some loose gravel and ran into a huge pothole that made the suspension bottom out, and the center stand slammed the road hard. The bike was taking a beating along that stretch of road. It rained lightly where I crossed the Liard River. I was often down to 40 mph and less because of huge breaks in the pavement, many of which were less than a hundred feet apart. I saw hundreds of square miles of forest that was devastated by fire. I stopped at a roadside snack shop for a light supper of cheeseburger and coffee. Later I located a small British Columbia campground a few miles from the Yukon border, near a fast-running glacier stream. I pulled in at 9:45 and was set up and settled by 10:30. I chatted with the only other camper there, a US Air Force guy who was headed for Eielson AFB in Fairbanks. 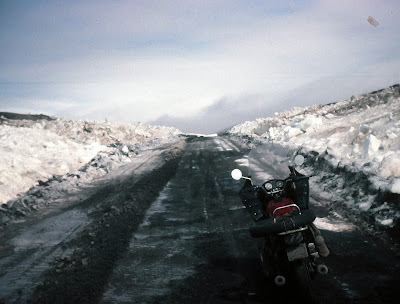 I covered 600 miles that day, almost all on gravel or badly broken-up macadam. It was raining lightly when I crawled into the tent to heat my evening meal. I reflected on the long day and thought it was probably the toughest day I ever spent on a road motorcycle. I was totally wiped out after 17 hours of steady riding with only about two hours sleep the night before. Day 7 - That night was a psychological disaster. It was and the lowest point of my trip. I worried a lot about the poor handling of the bike in the mud and loose gravel, I was getting increasingly concerned about the rear tire that wore much more than I had expected. Things I had been hearing about the Dempster Highway compounded my worries, and my waning strength was continually dragging me down. I dreamed about the match between Sugar Ray Leonard and Roberto Duran, where Duran threw up his hands and said "No mas!" (No more!) I felt totally inadequate for the trip. I felt like Duran in that bout, and I became convinced that I was on the wrong motorcycle for the Dempster Highway. I also hadn’t packed nearly enough warm clothing. I was gradually convincing myself that I would never make it to Inuvik. The roads were already bad, and they would only get worse farther north. This poorly-loaded Suzuki, especially the way it was loaded, was definitely the wrong set-up for a trip like this. To add to my deteriorating state of mind, there was about an inch of water inside the tent when I woke up. It had rained all night, and a lot of the water had gotten between the ground tarp and the bottom of the tent. I was actually lying in a huge puddle of water in the morning. My clothes, my bedding and most of my gear were soaked. I prepared breakfast inside the tent before rolling up all of the sopping wet gear. I decided while packing to totally abort my plan for Inuvik, and head straight for Anchorage, which I figured I could make in two days of steady riding if all went well. The sky was gray and overcast when I left the campsite, as was my state of mind from having decided to give up the main objective of my trip. I felt cold, defeated and depressed. The traffic was extremely light that morning. I stopped to oil the chain about 50 miles out. I hadn't seen another vehicle for at least 20 minutes. It was very peaceful on the road. The sun was shining by then, and the sky in the direction I was headed was clear blue. The horizon glistened with beautiful snowcapped mountains. For the first time in two days, I could get the bike up to 70 mph on smooth dirt, and it felt good. 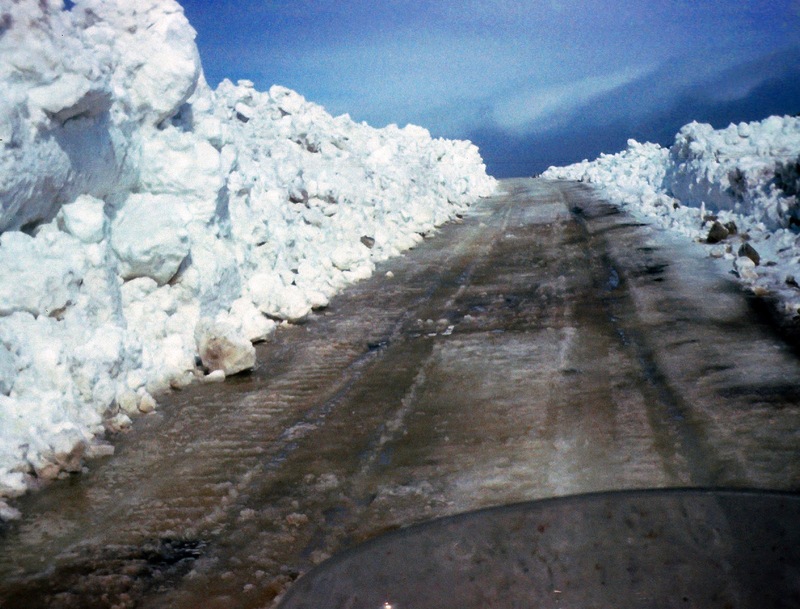 The condition of the highway in the Yukon was actually in much better shape than in British Columbia. I ate a second breakfast of ham and eggs at a Chinese place in Watson Lake, and I stopped at a small super market for provisions for that night. I had heard about a bridge being washed out on the Campbell Highway and I thought if I still intended to go north, I would have had to detour all the way to the Klondike Highway on the far side of Whitehorse. My full stomach, the clear blue sky and the better road conditions in the Yukon encouraged me to reconsider aborting my original plan. I did a lot of soul-searching while I rode, and I eventually decided it would be better to try for it and fail, than never to try at all. I had at least a glimmer of hope of making it now. I mustered up some fresh courage and decided to go for it, which gave me another rush of emotion for having reversed the decision. Not long afterward, my duffel bag suddenly came loose from the luggage carrier, and I almost lost it. I noticed that the longest and most critical bungee cord was missing. I turned around and headed back with very little hope of finding it; but good fortune was with me. I only had to go back a few hundred yards to find it. I had another close call later while passing yet another pickup camper that veered left to miss a pothole while I was alongside. I crossed the infamous Teslin Bridge with its deep, widely-spaced steel grating and got white knuckles again from the poor-handling bike. I wondered what it would be like with the same setup in the rain with wet muddy tires. The beautiful scenery in the Yukon Territory went on for hundreds of miles, with snowcapped mountains, sparkling blue lakes, and white-water rivers and streams. It was as nice as anywhere I have ever been. I believe the scenery in the Yukon and British Columbia is even nicer than several parts of Alaska that I saw on my previous trip. I rode into Whitehorse without realizing that it was Sunday. I had hoped to exchange currency, but I only got gas, after which I came back to the highway. A few miles west of Whitehorse I turned north on the Klondike Highway and experienced another rush of emotion as I turned due north toward the Dempster Highway. By now the rear tire had less rubber on it than the used spare I was carrying, but even that didn’t faze me. I was determined to go north this time, and I was totally convinced nothing would stop me now. I was on the Klondike Highway for only a short distance when I spotted a campground at Fox Lake. It was barely four o'clock, but I needed the extra time to dry everything that had gotten soaked the night before. I pitched the tent while it was still wet, and I hung all of the other wet things out to dry in the warm breeze. I was on the west side of a sloping hill, near the edge of the lake, which afforded maximum sunshine. I managed to dry everything and stow it away by 7:30. I prepared an evening meal of canned chicken and hard rolls, with canned prunes for dessert. My campsite was in a beautiful setting with the lake and snowcapped mountains in the background. Teenage campers strummed their guitars and sang folk songs until very late. 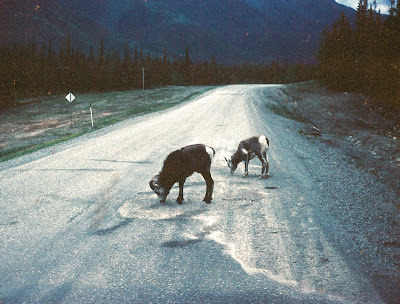 I asked around, but no one knew much about the condition of the Dempster Highway. One guy suggested that I check to see if the Peel River ferry was running because it was still so early in the season. He thought he remembered hearing that it was near Mile 320 in the Northwest Territories. I turned in around 11:00 with high hopes for the next day. Day 8 - I got very little sleep. The road crews worked until 3 AM. It was still twilight, but there was apparently enough light for the earthmovers and graders to work. The only sleep I managed to get was between 3:00 and 5:00 when there was a break in the roadwork. Around 5:00, a huge water truck began to wet down the soil for the next day’s work. I finally crawled out of the bag and heated a can of baked beans for breakfast. It was just above freezing out. Wearing nearly all of the clothes I brought with me, including my balaclava, I loaded up and headed north. The road was in fairly good shape and the meager bike service that I managed to do helped its performance a lot. My small vintage Harley mittens worked well enough against the cold, but it was difficult to operate my mini tape recorder with mittens. Plowed snow was on both sides of the Klondike Highway, which was mostly straight and level, with huge granite mountains on both sides that rise abruptly, less than a mile from the road. There were a few patches of green on the mountainsides, but otherwise they were solid stone covered with snow. It wasn't long before I began to get very cold again, including my feet. The highway was freshly treated with calcium chloride. There was very little loose gravel on the surface and no dust. I held the speed fairly constant at a little over 70. Occasionally a slight washboard surface would cause the forks to work extra hard. One of the fork legs had already begun to leak oil from several days of strenuous workout. I got emotional again that morning as I reflected on the decision to go north in spite of all that has been happening. I learned from my earlier trip to Alaska that changes take place in my psyche after long periods of physical and mental stress and exhaustion, and after being sleep-deprived for several days. Struggling alone like that in a totally exhausted state while being exposed to the extreme elements of nature can affect the minds of many outdoorsmen like mountain climbers, explorers, lifeboat survivors, etc. I feel closer to my faith during these trials, and I am constantly aware that the Holy Spirit is with me. What starts out as a simple motorcycle trip becomes an epic struggle for survival. I use every bit of strength I can muster to survive. When things finally go well, I'm convinced it’s because God has granted me that relief. Then I sometimes get so emotional that tears well up in my eyes. I never have the same experience while traveling with others. The Klondike Highway north of Carmacks was in excellent condition that morning. There were almost no loose stones on the surface, and no dust. The traffic was exceptionally light. I stopped for photos a few miles north of Carmacks, and again north of Pelly Crossing where I saw bear dung in a pull-off area. I passed a grading crew where the fast moving truck with the water and calcium chloride was followed a quarter-mile behind by two huge graders. They were all moving at roughly the same speed. About 50 miles from Dawson City it got very overcast and began to rain. There was a barrier across the start of the Dempster Highway with a sign that read, "Closed for the Season - Open June 5", and it was only June 1st. While getting gas there, I asked the attendant about conditions on the road. He thought it was passable for at least 231 miles to the maintenance camp at Eagle Plains; but beyond that, he wasn't sure. He heard that the ferry across the Peel River wasn’t running due to heavy ice floes, and two of the highest passes were still being cleared of ice and snow. I rode into Dawson City to stock up on provisions for three days on the Dempster. I planned to reach Eagle Plains that night. I figured my second day would be the longest and probably the toughest, which would be 460 miles from Eagle Plains to Inuvik on the Baltic Sea and back, provided I could make it through the passes and across the rivers. I planned to return from Eagle Plains to Dawson City on the third day, and hopefully beyond. It took about an hour and a half to make the 60-mile round trip into Dawson to pick up supplies. I stopped again at the gas station near the junction to top off my tank and fill two Prestone bottles I was carrying for spare gas. I had made makeshift saddlebags from an old pair of Carhartt pants sewed at the bottoms to carry the containers. I inserted one into each leg and draped the pants over the rear seat beneath all of my other gear. It was 1:30 when I squeezed around the barrier and started up the closed road. The scenery was outstanding. The road surface for the first 40 miles was in excellent condition, which reminded me of my 1977 trip up the Cassiar Highway days after it opened. It was drizzling and overcast as I climbed into the Ogilvie Mountains. At times I was down to first and second gear picking my way around and through minor washouts on the steep, twisty climb. The view from the summit was spectacular! I almost lost control of the bike as I turned to look, and became mesmerized by the breathtaking view, which was a panorama of heavily snow-clad mountains. The snow was piled high along the edges of the road. The entire scene was like a winter wonderland. It was like getting my own private viewing of the top of the world, like Admiral Byrd; although suddenly I looked up and saw a guy walking toward me. I could hardly believe my eyes. Where could he possibly be coming from or going to? It was a young guy with a beard, wearing a parka. He was leisurely walking down this otherwise, seemingly-deserted, closed dirt road. I wondered whether he was a hiker or if he lived up there. We exchanged smiles and waves and continued on our ways. About eight miles farther, I saw a small, well-kept log cabin with a sign, "Pete Jensen, Outfitters". Many tools and other paraphernalia for panning gold were strewn around the yard and hanging from the sides of the building. A wide, flat plateau began around Mile 60. A narrow ice-covered stream ran alongside the road. I was traveling only about 30 to 40 mph because of the billions of sharp loose stones. Some were big, and they presented serious handling problem. First there was just a strip of half-inch gravel in berms in the center and on the edges, with a single car track, but later there were stones of all shapes and sizes, spread across the entire road with no tire tracks. Most of the stones were crushed and appeared to be sedimentary rock. My wheels kept crunching and snapping them up under the bike. They would then smack against the underside and skitter out in all directions. It was impossible to pick a clear path. I was in a constant struggle to maintain control, with white knuckles and sometimes cramps in my hands from holding the grips so tight for so long. I saw a small settlement that I thought might have been an Indian village. A sign nearby said the road was originally a trail established in 1905 by the Mounties. I tore the leg of my rain suit on the buddy peg while trying to get the bike on the center stand to oil the chain. It was extra heavy with the spare gas and food provisions, and I was not as strong as I was when I started, especially on only two hours sleep for the second consecutive night. I had actually slept very little during the past three nights. I came across a one-ton pickup with a small utility trailer that was abandoned in the middle of the road. There were three loose wheels with flat tires in the rear bed, and a fourth flat on the rear wheel of the truck. The doors of the cab were unlocked and the window on the passenger side was open. There was a Sanyo tape deck in clear view on the front seat, with a full box of tapes. The guy probably figured if someone had theft in mind, at least his window wouldn’t get smashed with a rock while stealing his stuff. The mountains that rose abruptly several hundred feet from the road were a pastel shade of blue. I wondered if it was the actual color of the stone, or if it was an illusion. At Mile 136, I stopped to rest and catch my breath from the constant struggle. I was huffing and puffing as if I had just run a half-mile sprint. I was literally out of breath. I transferred the two extra gallons of gas from the Prestone bottles into the tank. I said while breathing heavily into my tape recorder, "Stones, stones, billions of stones! When will it ever end? I'm exhausted." Whenever I stopped, birds that looked like small swallows would often alight just a few feet from me, apparently unafraid, curious and hungry. The temperature was in the high 30s, and it was raining lightly. In spite of constantly fighting for control, my feet were cold, my hands were cold and I was getting cold around my shoulders. When the rain turned to snow at one spot, I stopped to put on my rain suit top, which was the only thing I had left that I wasn't already wearing. As I was about to get off the machine, I saw a huge form on the shoulder of the road. When I turned to look, I saw it was a bear, sitting on its hindquarters and watching me. He was about the same height sitting, as I was on the bike, and he was staring at me with a quizzical look. I restarted the engine and got out of there as quickly as I could, and went up the road another mile or two to put on the rain suit top. I recalled what the gas station attendant at the junction said about huge grizzly bears that are often seen in that area. I wasn't sure what kind of bear it was, but I wasn't about to wait around to find out. A heavy fog settled in near Mile 180. I might have been in the clouds at the time. It was a fairly high altitude, and I was crossing the Continental Divide, which the Dempster Highway does about three times along its 465-mile length. Ice had formed on the low bushes on both sides of the road, and the road surface was getting extremely slippery. Soon there was a four-inch quagmire of slimy mud on top of the frozen surface. The thought of turning around crossed my mind several times, but I had already passed the point where I would have used up half of my gas, so I had to keep going. I was in first gear churning through the deep mud for more than eight miles. A few times I got the bike momentarily stuck in it. I rode mile after mile with both feet skidding along the ground. In some spots where the mud was not as deep, I tried to ride with my feet on the foot pegs, but invariably I would lose it again, and I'd have to put one or both feet down to drag them on the road. At around Mile 200 I was surprised to see headlights in my rear view mirror through the snow and dense fog. I was struggling at less than 10 mph with both feet down at the time. He didn’t close the gap very fast, but eventually he came alongside and we both stopped. It was the maintenance superintendent from Eagle Plains in a VW Beetle. He said he had been trying to figure out what was making those strange tracks. He said he would see three tracks, then sometimes two, and occasionally only one. He laughed and said, “Mostly three.” He asked if I was OK. I responded by asking him how far it was to Eagle Plains. He said, “Maybe another 30 miles. Will you be able to make that?” I answered, “I guess if I’ve come this far, I should be able to make another 30 miles, - as long as it doesn’t get much worse.” He said if I wasn't in within an hour or so from the time he gets in, he’d send help. He wished me good luck and slowly moved away with the VW's wheels churning and spinning in the mud. When I finally got to the maintenance camp, I asked if they knew how long the storm might last. I was carrying food for three days, and I was concerned that I may be stranded for longer. Neither the motel nor the restaurant was open, so I asked at the maintenance office where I could pitch my tent. The guy's eyes opened real wide and he said, "A tent? In this weather?" I said, "Yes, do you have a campground?" After a pause he pointed to a spot on the tundra about 400 feet away that was covered with snow. He said it was the area they had cleared for campers, but they never considered tent campers. The blizzard was raging quite strong at the time. It was difficult to even make out where he was pointing. It took at least a half hour for me to put up the tent in the frigid winds and blinding snow. The temperature was around 28°, with 20 to 30 mph winds, higher in gusts, which was driving the snow horizontally. The wind chill must have been well below zero. I put my spare tire on one corner of the tent, my suitcase on another corner, and I maneuvered the bike around to put the front wheel on a third corner as I struggled to get the tent up. I finally got the ground tarp laid out, and the tent assembled on top of it while the wind kept everything flapping. The tundra underneath was frozen, so in spite of my efforts, I wasn’t able to drive stakes into it. The last time I ate, except for a few raisins and a hard roll from my bag, was breakfast at 5 AM in the tent at Fox Lake. It was 9:30 PM by the time I got everything set up. I quickly put the suitcase and spare tire inside to keep the tent from taking flight until I could crawl in. The tent alone weighed only a few pounds, and it would have gone tumbling across the tundra if I didn't get weight into it fast. I heated a can of Spam for my dinner. I had to put the tiny butane stove on my suitcase because the floor of the tent kept billowing up from the wind, which would have knocked the stove over for sure. It was a very full 17-hour day with almost no food. I crawled into the sleeping bag with all of my clothes on except the muddy boots and enduro jacket. I even wore my balaclava to keep my head warm. Fortunately I carried an old woolen Navy blanket, and I covered my upper torso, shoulders and neck with it since my bag was only rated for about 20°. I took an OTC sleeping pill and managed to get to sleep around 11:00. Day 9 - The blizzard raged all night. Snow blew in through the tiny vent holes in the top corners of the tent. I zipped up the vents, but the wind still forced the snow through. By morning, everything inside was covered with a thin layer of fine snow. The walls of the tent flapped wildly all night like a flag in a windstorm, which woke me a few times. It was so loud and menacing that I was afraid the tent fabric would shred, leaving me to lie out on the open tundra. Wherever there was no weight on the floor, it billowed up. A lot of the snow got packed underneath between the tarp and the tent. When I got up to urinate during the night, I had no jar to use, so I knelt in the doorway. I was glad I had the foresight to put the opening to the leeward side. While crawling around inside the tent in the dim light, I put the heel of my hand down on the only pair of glasses I brought with me. My weight snapped the plastic frames at the bridge of the nose. I made emergency repairs with a pencil across the top of the frames, which I taped carefully to both pieces. I wore them that way for the remainder of the trip. During the night, as I lay awake listening to the strongest winds beating fiercely against the side of the tent, I thought about my friends at home warning me about the bugs and mosquitoes in the far north. I laughed, and thought no one ever warned me about freezing to death in the tent. I thought I could hold out as long as the tent could, but it often sounded like the tent was waging a losing battle. I would lie there and reminisce about the hardships of the previous week, and I would actually get laughing about it. I didn't realize at the time that giddiness is one of the early signs of hypothermia. I tried to think about various contingency plans, but I couldn't concentrate, which is another sign. I thought about possibly needing to be airlifted out by helicopter, and I thought about how airsick I would probably get, and I wondered what would ever happen to the bike. Then I wondered what Jeremiah Johnson would do in a case like this. I thought he would probably be out there lying on the open tundra, wrapped in a bear skin. He didn’t even own a tent. It was almost like daylight inside the tent at 3 AM. 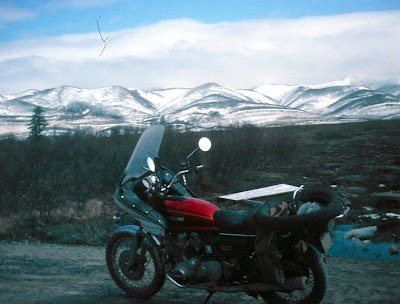 I was about 12 miles from the Arctic Circle at the time. I heated breakfast around 6:45 while still in the bag. There was nothing for me to get up for. I couldn't ride anywhere. The snow outside was several inches deep and there were drifts all around the tent. Around noon, there was a brief respite from the storm, so I figured it was a good time to head for the rest room in the maintenance building to clean up a little and use the toilet. The maintenance guy mentioned the previous night that the rest room was there for the use of the campers. Of course I was the only one. As I walked back to the tent I saw someone standing next to it with a strange look on his face. I think he had been calling out, and getting no answer. When he saw me, he said, "Are you the fella’ from the tent?" I said that I was, and he said he came out to see if I was still alive. He said the guys down at the camp were making bets, and the odds were that I wasn't. He said, "Don't you know it's cold out here?" I said, "Yes, I noticed." He said he had heard about Jack London and guys like that, but he never thought real people did that crazy stuff. He invited me down to have coffee with the crew. I said I would when I got squared away and the wind died down enough, and when I felt it was safe to leave my things for an hour or so. He had no idea how long the storm would last. After getting up, I cleared away some of the snow from between the tent and the tarp, which was keeping the floor wet. I noticed that the foot end of my sleeping bag and some of my other gear had already gotten wet. I tried to arrange the tarp so it wouldn't happen again. By 3:45 the temperature rose into the low 30s and the wind calmed down a little, so I walked down to the snack shop where some of the maintenance people were still having coffee. I met some of them and we talked for a while. Several others were out working. I learned that the temperature had gotten down to 18° during the night. With the wind chill factor, it was probably well below zero. There was some speculation that it would get even colder that night, and that the storm would continue. I told them I was OK with it. I went back to the tent and crawled back into the bag because it was the most comfortable place to be. It stopped snowing for a while around 6 PM, but the temperature was dropping steadily. I ate some supper in the tent and girded up my loins for another night. Day 10 - The wind soon picked up and blew under the tent again. Everything that had gotten wet the previous night was freezing up. My boots near the entrance froze like two big chunks of ice. The foot end of my sleeping bag froze stiff. The walls of the tent flapped wildly again as the wind increased. I woke up at 1:30 from the loud noise of the thin nylon fabric flapping fiercely. My head felt very cold in spite of the balaclava, so I pulled the woolen blanket over my head, leaving only a small gap to breathe through, and I fell back to sleep. I woke up briefly at 3:00 and felt very uncomfortable all over from the cold. Finally I woke again at 4:00 with fierce tremors over my whole body. I figured that hypothermia was probably setting in for sure, or that something else serious was happening. It was colder than the previous night, and the wind was blowing at least as hard. Two inches of fresh snow were on the ground. Fortunately, I had the presence of mind when I got the tremors to eat something and make coffee for myself. I figured I had better stay awake for the rest of the night, or I might slip into hypothermia for sure, and never wake up. I heated a can of spicy chili beans with meat, and I had that with the coffee. I continued to have tremors every few minutes for about an hour. I had a tough time eating with my hands shaking so much, not to mention holding the coffee cup. I thought again about possibly having to be airlifted out by helicopter, and I began to worry a lot about the predicament I had gotten myself into, but I trusted in God. I stayed in the bag until about 10 AM contemplating my options. There was four inches of fresh snow on the ground with more in drifts. I realized that my body couldn't take much more, and I had to do something. I thought about moving into the rest room and taking my sleeping bag with me. I was the only one using the room, there was heat inside, and it was clean. My second thought was to ask the maintenance people if I could find a corner in the garage where I might lay out my sleeping bag, or even put up the tent inside the huge garage. The next thought was to go down to the motel and see if they would consider renting me a room, even though the place was closed for the season. I was sure there must be people getting it ready for the first tour group that was due to arrive in two or three days. I went down at noon to check on it, and they agreed to rent me a room. The price was $50 a night and I had to be out before the weekend, when the first group of 37 people was due to arrive. All rooms were reserved from then on. I planned on two nights in the motel, and then I would be out, no matter what condition the road south was in. Mainly I needed a full night of restful sleep, which I hadn’t gotten for almost a week. The room was new, modern and beautiful. I brought all of my wet gear in to dry, most of which I hung around the room. I put my frozen boots near the heater and laid out the tent and tarp to dry in the garage. I washed out a few things in the sink and hung them to dry. It was the first time I had my clothes off for five days. I took a long, hot bath and got into bed. I woke up about two hours later feeling depressed. I thought that by renting the room I had surrendered to the elements, and again I felt like Roberto Duran. It was also Lillian's birthday, and I had to find some way to call. If I didn’t, she would certainly think something bad had happened to me. There were no regular telephones, but I figured there must be a radio-phone in the maintenance office. I made the call from there, but I got emotional as I began to tell her about all of my incredible experiences of the past week. I tried not to alarm her, so I didn't mention the hypothermia. When I tried to talk a little about my adventures, I couldn't get it out without having my voice waver. Eventually we talked a little about her birthday and about the family, and I told her I was fine. I felt much better afterward. I heated Spam for dinner and had that with a sourdough roll and coffee in the room. I took a walk after dinner and studied the condition of the road and the sky. The road was covered with snow, and it was still snowing lightly, but it was beginning to look brighter in the east. The wind also seemed to have diminished a little. I began to make plans for the following day as things began to look up. I had a full stomach, a rest, a call home, and the sky was brightening, which was all I needed. The maintenance guys said the road north was in much better shape than the road south, which was still a quagmire of mud. I told them about my decision to head north for the day. They said I may have problems getting through the two passes, and that the Peel River would be a major obstacle because the ice had broken up. They didn't think the ferry captain would start up the ferry and churn across the river through the heavy ice-floes for a single biker on a joy ride, especially when the road was officially closed. Day 11 - I slept for a solid nine hours in the comfortable bed and quiet surroundings. It was my first good sleep in a week. The sky in the east looked slightly dark again, but I could see the sun through some high, thin clouds. The snow had stopped, but the wind was still quite strong. I ate baked beans in the room, which was the last of my canned provisions. The temperature outside was 36°. I thought I could probably have survived in the tent that night, or at least it wouldn't have been as bad as the first two nights, but I doubt I would have gotten as much restful sleep. I left all of my gear in the room except for the clothes that I wore, and I left the tent spread out to dry in the garage. I topped off my gas for a round-trip of 180 miles into the Northwest Territories. I didn't know exactly where it would take me, but since the road south was still in very poor condition, I decided on the afternoon ride north. I left around noon. The second of two mountain passes north of the Arctic Circle. The Arctic Circle was only 15 miles north of the maintenance camp. The sign was laying flat on the ground, probably broken off by the high winds of the past few days. I stopped and tried to prop it up for a photo, but I couldn't get it to stand by itself because the wind was still too strong. I even tried to pile rocks around the base of the posts, but I eventually gave up, headed north, and I left the sign for the maintenance people to deal with it. It soon dropped below 30°, and a steady 45 to 50 mph wind blew out of the west. I had to lean the bike into the wind constantly, and tried to keep my head as close behind the windshield as possible to ease the biting pain of the crosswinds against my face. I managed to climb through the two passes, both of which were still covered with ice and snow. The crews were there working with huge graders. Ice had built up on the road to a thickness of several feet in a few spots. There was a detour near the first pass for vehicles to get around the ice by riding over some grassy tundra while the crew worked on clearing the ice and snow from the road. My rear wheel spun on the ice quite a bit at the second pass, and I had to use both feet as outriggers to inch my way up and over the top. I realized I would have had great difficulty if all of my gear was on the rear carrier, most of which I left at Eagle Plains for the day. When my odometer indicated that I traveled 90 miles from Eagle Plains, which meant I had burned about half of my gas, it was time to turn around and head back. I was only a few miles from the Peel River at the time. I was concerned that the huge drift at the divide might close the road at any time. Strong headwinds could also affect my gas mileage. About every ten miles, I could see where the sides of the mountains had been dug out for fill, and for road construction. South of the divide, the crosswinds were still very strong. I held a gloved hand up to my face constantly to shield it from the biting wind. The sun was out at Eagle Plains, and the maintenance superintendent said most of the road to Dawson City was now in pretty good shape. He had just come up again in his VW Beetle. He said there were still spots where snowdrifts were across the road, but a few trucks had already been through. He said by tomorrow morning it should be clear of most of the snow and mud. I had a delicious veal cutlet meal at the restaurant, which had just opened for the season, and I was in bed by 11:00. Second of two mountain passes north of the Arctic Circle. Day 12 - I topped off my tank and filled the two Prestone bottles with gas, which cost 59 cents a liter at the maintenance camp. My fill-up came to $12.00, or about $1.90 per gallon. I left at 8:00 after warm good-byes with my newfound friends who came out to shake hands and wish me a safe trip. I rode across a few very rough sections in the first 40 miles, and through some fog and colder temperatures at the higher altitudes; but the road was in much better shape than when I came up. When I oiled the chain about halfway down the highway, I had my usual tough time getting the machine onto the center stand. Clouds obscured the tops of the mountains, but the sun broke through around halfway, where I transferred the spare gas into the tank. The temperature eventually climbed into the high 40s, which felt good after several days below freezing. I inspected the rear tire and seriously considered mounting the spare. The surface was completely bald, and it was torn up with hundreds of cuts from sharp stones. I suppose I should have changed it at the maintenance camp when I had the opportunity. I hadn't realized it was quite that bad. The most beautiful scenery of my return down the Dempster was in the Ogilvie Mountains where there was a great deal of snow. About forty miles from its end at the Klondike Highway, it clouded over and the temperature dropped again. Before I got to the junction it was raining. I got gas and provisions in Dawson City before making a beeline for the Yukon River ferry landing. I arrived just in time to see the loading ramp being raised. I had to wait an hour in the rain for its return. It then rained most of the way across the Top-of-the-World Road. There was still a lot of snow at the higher elevations. I had to detour on temporary roads at least three times where snowdrifts blocked the road. One of the detours was rough with narrow switchback turns, washouts and steep grades. I was down to second gear a few times, churning through loose stones. The Top-of-the-World Road is still one of the most fascinating roads I have ever traveled. It rained part of the way across. I ran into some hail near the US customs station. I stopped at the small village of Boundary for gas. Frank, one of the guys I met at Eagle Plains suggested that I say hello to Action Jackson, who owned the business there. I walked into the bar and asked for him. The girl bartender pointed to a strange-looking dude, doing his books at one of the tables. He was a small, thin man. His face was very pale, his jet-black hair was slicked back, and he had a long thin mustache that curled up at the ends. There was very little light in the place except behind the bar, and there was a small desk lamp on the table where he was working. I smiled and said, "Hi, are you Action Jackson?" He looked at me like maybe no one calls him that and he said, "Who wants to know?" I thought about a guy I had seen in a movie once who had a gun under the table, and I would have felt better if I could have seen both his hands. I told him I had just come from Eagle Plains, and that Frank, who used to work for him, said to say hello. After an uncomfortable pause, he said, "Frank who?" I figured it would be a good idea to get out of there. As I turned to leave I said, "Well, have a nice day, Mr. Jackson." He didn't answer, and I wondered why Frank ever suggested that I stop. I thought maybe it was because he just wanted me to get a look at this strange dude. It rained a little, mixed with hail between Boundary and the blacktop at Tetlin Junction, which was the first paved road I had seen in several days. The final 100 miles of dirt on the Taylor Highway was very rough and twisty. I was down to 15 mph several times. The occasional hail that stung my sore face, made the ride even tougher. There was still quite a bit of rain around as I searched for a place to camp. I had hoped to find a spot southwest of Tok where there were very few signs of civilization and beautiful scenery. I rode for a long while before finally locating a state-run campground about 14 miles before Glennallen. I got the tent set up by around 10:30 and crawled in to prepare my evening meal of canned chuck wagon stew, rolls and some good cheese. I had traveled about 600 miles of mostly rough gravel roads from Eagle Plains where I started the day. My aching body was a testament to the roughness and length of the ride. Day 13 - After I got into the sleeping bag, a guy pulled in the campground with a pickup truck and double-camped in my space. He set up a huge tent, blocking my way out. There were plenty of other spaces around, but he chose to double-camp in mine. I woke up early, ate and packed my things. I considered waking someone to move the truck, but I spotted a narrow pathway up through the trees, which I used to get around the guy’s tent, and out of the campsite. I made enough noise spinning the rear wheel on the steep path to wake up the whole camp. The miles seemed to go by much faster than the previous night when I was over-tired. Every mile seemed like an eternity. It was cold as usual at Eureka Summit, with fog and light drizzle. My feet and hands were cold and I felt cold all over again. I rode many miles of twisty roads through the Matanuska River Valley, and stopped to see the Matanuska Glacier from a distant lookout point along the highway. Most houses I saw were quite rustic and looked like squatter's shacks. I thought the same in 1977 when I saw abandoned cars and other junk and garbage strewn around many of the dooryards. Whenever I stopped for gas, food or lodging, I was also reminded that the temperament of many of the people who live along the highway matched their dooryards. I rode the last 40 miles into Anchorage under blue skies and warm sunshine, with the temperature at 50°. I forgot about the two-hour time change at the border, and I realized when I arrived at Donna's that I actually left the campground around 3:30 AM. I thought about the campers who I probably woke in the middle of the night. I didn’t feel bad for the guy who double-camped in my space though. I arrived just as Donna was getting up, and Rey was leaving for work. It was Saturday, and my first chore was to go out and find a new tire. I was still riding with the almost-bald one that I left NY with. My plan was to keep the spare I had been carrying back to New York in case I needed it. I tried to find a place to get my glasses fixed, but no one had the right frames. I visited with Donna, Rey and Asia for the rest of the day and evening. Later the same day Asia got a fever of 104°. She was only a year old at the time. Donna rushed her to the emergency room at the base hospital and learned that it was an ear infection. I went into town that evening with Rey while Donna worked at the childcare center. The next morning she and I went to a family restaurant called Flippers for Sunday brunch where I had steak and eggs with a huge piece of cheesecake for dessert. I spent days 14, 15 and 16 with Donna and her family at Elmendorf. I replaced the rear tire and sprocket, made the very first chain adjustment of the trip, filed and adjusted the points, washed the bike, washed all of my clothes and stocked up on provisions. We visited several interesting sights around Anchorage during my stay. My odometer indicated that I traveled 5,200 miles since leaving New York, most of which were cold, tough miles. Day 17 - I left on Wednesday morning, a little before 8:00, carrying snacks for the next several days, including some freshly smoked salmon that Rey had caught recently and prepared in his smoker. It was partly cloudy and 50°. The skies seemed to foretell a nice day, but you never know in Alaska. When I stopped to oil the chain about 30 miles past Glennallen, it was still 60° with only a few clouds around. Less than an hour later it clouded over and began to rain. I stopped at a small rest area about 30 miles before reaching Tok, and ate lunch from my bag. It was a scenic spot with mountains all around. After getting back on the road, I rode for another 7½ hours to the Canadian border, stopping only once for gas. I got a headache while riding over the rough, dusty washboard roads in the Beaver Creek area. The temperature was in the 30s. It sprinkled several times, and rained quite hard a few times. The road surface alternated between dusty and slick. A few of the showers were mixed with hail that stung my face. I passed two crowded campgrounds in the rain before finally settling on one about 50 miles short of Whitehorse, 660 miles from where I started the day in Anchorage. I lost two hours due to the time change at the border, so it was after midnight when I stopped to camp. I heated a can of beef stew inside the tent and ate it with sourdough rolls, cheese and coffee in the semi-darkness. Day 18 - I was up at 7:00 and on the road in an hour and a half, which was faster than usual with the tent, mainly because the mosquitoes were very thick. They seemed to ignore my Cutters lotion. Hundreds swarmed around my head while many made Kamikaze attacks into my eyes where they probably sensed I had no lotion. I hurried through a can of beans and coffee for breakfast, and got out of there as quickly as I could. My clothes were full of mud, and the bike was covered with it. There was no water at the campsite so I couldn't even splash some on my face. I had barely enough water left in the canteen to make coffee and rinse the utensils. I stopped at Jake's Corner for gas, and was waited on by an old woman who was just as crotchety as old Jake was on my first trip in 1977. I concluded that this must be his wife. I had a splitting headache at the time. I dropped the bike about five miles from Jake's Corner in deep mud in a long muddy construction area. I had been churning in first gear through deep ruts when the rear end spun out and I lost it. I got up and tried to lift the bike back on its wheels, but I couldn't even stand. My feet kept slipping out each time I tried to lift it. The mud was slick and ankle-deep, and it was raining quite hard at the time. I was sure I couldn't lift it with all of the weight piled on, so I began to unhook the bungee cords to unload the luggage into the mud. A truck driver from an 18-wheel rig that had been following me through the construction, climbed down from his cab and grabbed one end of the bike to help. He said with a French accent, "It's not a good day for motorcycles. I hope you don't have far to go." I felt embarrassed telling him I was on my way to New York. After I said it, he looked at me strangely and didn't say anything else. He just stared at me with a strange look and lifted. I thanked him kindly as he climbed back into his truck. It was Sunday when I passed through that area earlier on the trip in the other direction. Truck traffic was much lighter then. This heavier traffic meant I had to be constantly on the alert while passing vehicles in either direction because the slick surface made it much riskier. The wet calcium chloride sections were very slick and treacherous. I had trouble getting the bike to stay on its center stand to oil the chain because the mud was packed up underneath so thick that the stand wouldn't go all the way to its park position, which caused the bike to roll off the stand. I stopped at a few campgrounds to look for water to take with an aspirin. I finally found water, but then I couldn't locate the pills. Luckily I got to the dreaded Teslin Lake Bridge between rain showers. The deep steel grating still gave me the horrors with the poor handling of the bike, even without mud on the tires. At one of the gas stops, the kid who pumped my gas spilled it all over the tank, and over the hot engine, causing billows of gasoline vapors to rise. I saw a sign saying the attendant must pump the gas, and he was trying to wait on two customers at one time. The price on the pump was set to indicate ¼ of the amount because the total price for some of the trucks and large RVs exceeded $100, which was more than the dial could indicate. The people they hired are usually unable to multiply the indicated amount by four to get the actual price, so they have to go inside to work it out on a piece of paper. Apparently they weren’t capable of using a hand calculator either. The kid came back and said I owed him $7.78. I said, "Four times $1.92 is $7.68, not 7.78." He looked at me strangely and went back a second time to try it again. He returned to say it was still $7.78. It was only a lousy dime, but I went in with him to walk him through his faulty multiplication, after which I handed him my credit card. He made two mistakes with that too before I finally got out of there. About a million potholes, a half-dozen rain showers and one heavy hailstorm later, I was on my way down the Cassiar Highway. Before turning off the Alaska Highway, I faced a steady stream of RVs and pickup campers headed for Alaska, which looked like a convoy, although it could have just been an awful lot of traffic. It got to a point where I hated to see another RV. I had to duck constantly to avoid being hit by flying stones, and the drivers that I passed would almost never check their rearview mirrors before swerving to avoid potholes. The horrible traffic, coupled with the slick road surface, combined to make the ride very unpleasant. 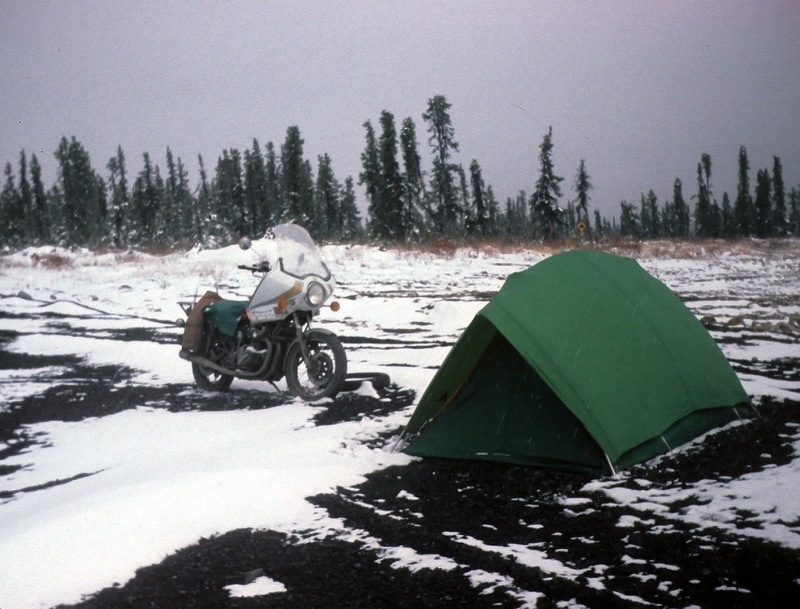 The first 40 miles of the Cassiar wasn't much better. At first it was extremely dusty, like it hadn't rained at all. Several short sections of the first 100 miles were paved, although after Dease Lake it was all dry dirt with fast-moving trucks leaving a half-mile-long trail of dust. I spotted the peaceful camp area by Tatogga Lake where I stopped in 1977, but there was a lot of litter and garbage lying around that turned me off. What a difference four years can make! I ran into light rain about ten miles past the lake, which soon got much heavier. I was far enough south by then that it was dark around 10:30, especially with the rain. I had almost forgotten how dark it got at night. I looked for a long while for a good place to pitch the tent. After it got dark, I was desperate to get it set up. Finally I settled for a small emergency pull-off area where a truck had recently dumped a huge load of bank-run gravel. I stopped at a few other pull-off areas earlier, but they were all under water. I decided to pitch the tent on the pile of gravel to stay out of the mud. I kicked some of it around to level the top, and I proceeded to set up the tent on the gravel heap. It was pouring when I finally crawled in, covered with mud. I took off my wet, muddy outer clothes and boots at the entrance. It was the second night in a row I crawled in while wet and full of mud. I had nothing with me for a hot meal because the co-op store in Iskut was closed when I went by, so I ate some of Rey's smoked salmon, a stale sourdough roll, some sunflower seeds and coffee. I got into the bag around midnight. I was exhausted from 550 miles of slick mud, heavy RV traffic and blinding dust, on one of the toughest riding days of the trip so far. It's not fun that way, but it's still a challenge, which reminded me again of some of my tougher enduros. Day 19 - I ate a bowl of instant rice for breakfast with coffee and cheese. It was still raining, so I rolled up all of my gear wet and tied it on the bike. Everything was soaked and covered with mud. The fog was so thick when I started that I could see for only about 25 feet. I stopped at Stewart Junction for gas and headed down the final, narrow 92-mile section that I remembered so fondly from 1977. Occasionally a logging truck would come the other way and leave me only a few feet of the shoulder. I had to be careful because they always seemed so ruthless. I rode on alternating sections of new tar, old road, and freshly graded roadbed. It was foggy and raining most of the way through that final section of the Cassiar. Some of the new gravel roadbed was very slick, and pockmarked with millions of muddy puddles. It was raining hard, with the temperature in the low 40s. My hands and feet hurt from the cold and I was having occasional chills. I continued riding between 45 and 50 mph across the wet washboard surface. I thought if the forks seals were ever going to give out, now was the time. The bike shook relentlessly as it splattered through the muddy puddles for 30 miles. With the awful handling that the bike had shown over the previous three weeks, it was a small miracle I didn't lose it there because I felt numb and disconnected from my concentration. I seemed to be charging along on autopilot, just holding on and staring straight ahead. I made it through the Cassiar in one piece and stopped for gas in Smithers. I had serious thoughts of giving up before noon because I felt so cold, exhausted and miserable. The motel looked tempting, but I passed it by. The rain continued for another 30 miles before it became overcast, and the temperature rose to 50°, although I was wet underneath and still felt awful. I thought about stopping in Prince George too, but after cashing a traveler’s check in Burns Lake, the sky began to brighten a little, and I even saw the sun a few times. I figured it was a sign that I could go a little farther, and maybe camp again that night. So I stocked up on provisions in Vanderhoof and continued past Prince George without stopping, and began the scenic climb into the Canadian Rockies toward Jasper Park. I was having a problem with drowsiness on the blacktop, but I managed to ride 650 miles that day, which put me just past Mt. Robson, where I found a provincial campground in the shadow of Canada's tallest mountain peak. I averaged 54 mph for the day. I finally got the chance to wash my face and hands with some ice-cold well water from a hand pump. I also cleaned up my utensils and had some Spam, sourdough rolls and coffee in the tent. It was an extremely tough 12-hour day. Day 20 - I awoke with the sound of rain on the tent again, but I had slept well on the thick bed of pine needles, which was much better than the bank-run gravel of the previous night. I woke up dreaming about a white dog. They were usually scruffy and growling. Usually when I dream about a dog it means problems with one of my boys, but it was never a white one. I shrugged it off as indigestion from the Spam, and I took a Tums and fell back to sleep for a few more hours. I got up at 5:00 and heated spaghetti and meatballs on my tiny butane stove and waited until just before leaving to pump some fresh water. The noisy hand pump was close to another guy’s tent. It was raining steady again when I left at 7:00, and it was coming down quite hard. I was dispirited and depressed as the bike climbed into the Canadian Rockies in the heavy rain and dark overcast. I wondered if God was still with me. It seemed like I was having such a terrible time of it with all of the foul weather and horrible road conditions. Suddenly a perfectly round opening appeared directly overhead in the otherwise dark overcast and rain. It was the size of a football field, and it revealed a bright clear-blue sky. It was still raining and dark everywhere else, except directly over my head. The opening seemed to be getting larger as it followed me for almost a mile up the road, drenching me in warm sunshine. I was awestruck! I took it as a reply from God. Then, just as suddenly, the huge gap snapped shut, and it immediately got dark again and the rain returned. I was alone on the road at the time, and no one saw it but me. I was really shaken. I broke down and cried. I turned onto the Icefields Parkway and saw two huge female elk grazing alongside the road. The Icefields Parkway through Jasper and Banff Parks is one of the most awe-inspiring scenic rides I have ever ridden, even in the rain. I spotted several white goats, or sheep, feeding alongside the highway near Athabasca Falls. As I neared Banff Park, the rain turned to snow, which came down so heavy at one point that it packed against my windshield and fairing, and it began to accumulate alongside the road on top of old snow that was left from earlier storms. At Columbia Icefields it became a mixture of snow, sleet and hail. Before I left the campground that morning I had packed my mittens and balaclava deep in my baggage, thinking I no longer needed them. Some of the scenery in Banff is even nicer than Jasper. The mountains are closer to the road, and some of the highlights are more spectacular, like the "Weeping Wall" where twin waterfalls cascade down the face of the mountain in two long streams. I got another severe headache and stopped to dig out some pills, which were near the top of my bag this time. I suspected the headache was from my helmet being too tight after having done some maintenance on the inside band. Once when I stopped at a rest area in Banff, I noticed the chain was in need of an adjustment, so I stopped to adjust it, and I oiled it. I stopped for gas in Banff where two guys were standing by their luxury sports car and staring at me while an attendant pumped their gas. I must have been a sight to behold. My clothes and the bike were totally covered with mud, and it was snowing quite hard at the time. I hadn't shaved for about a week, not to mention my glasses with the pencil taped across the top to hold them together. One of the guys walked over behind the bike and looked at my plate, which was barely visible through the thick layer of mud. He said, "Wow, you're a long way from home!" I said, "Not nearly as far as I was four days ago." I must have been quite a sight. A mixture of snow and sleet against my face made the skin painful and raw. At the lower altitudes, the snow gradually changed to sleet and rain, sometimes heavy. My feet were wet again, and I felt cold all over. At Radium Hot Springs, I saw people swimming in a large outdoor steaming pool, fed by water from a natural hot spring. I envied them. It continued to rain, sometimes heavy, for the next 150 miles. I would think each time it began again that it was only a shower, so I wouldn't stop to put on my rain suit. By the time I would finally stop, it would be too late because I would already be soaked. I would try to duck behind the windshield to avoid the sleet that beat against my face for hours, but the pain only got worse. When I finally pulled into the US customs station at Eureka, Montana, I was at the very limit of my endurance. The customs guy came out smiling, but his expression changed when he saw me. He said, "Are you all right?" I said, "No, I’m not. How far is the nearest motel?" It's a good thing he didn't make me open all of the bags and spread all of my stuff out for inspection. After a few of the usual questions, he directed me to a motel about seven miles down the road. It was only 3:15 when I got there. It was the earliest I had thrown in the towel on the entire trip, but I hadn't seen the inside of a building for four days, and I was cold and wet during almost all of that time. I simply couldn’t take any more. I checked in and hung my things around the room to dry. Most of the clothes in my suitcase were wet, including clothes that were rolled up in plastic bags inside the suitcase. I washed out a few pairs of the shorts and socks in the sink, and rinsed out a few sweatshirts that were already wet. I didn't wash my jeans because they probably would not have dried by morning. I hung everything over and around the heater, which I set on high. I then got into the tub and lay in the hot water for a long while, leaving the hot water faucet open a little to keep it hot. I had a light snack in the room before going out to look for a restaurant within walking distance. When I saw none, I made dinner from my provisions again, which by that time was mainly the smoked salmon that Rey had given me in Anchorage. Day 21 - It was foggy and overcast when I got up. I left the motel at 6:00 and traveled through mostly Montana farm country with gently rolling hills. The fog was thick in places, making the visibility poor. I rode the first ten or fifteen minutes in steady rain. It was Sunday, and most of the gas stations in Whitefish were closed. I finally found a small convenience store with gas. My impression of Montana was that everything is big - the hills, the valleys, the lakes and the sky. Polson struck me as a nice town nestled in a huge valley with Flat Head Lake as a scenic backdrop. It was 47° when I stopped for an early lunch at a KFC in Missoula. I had planned to tour Idaho but I dropped the idea because of the weather and how I felt. A ride through Idaho would have been anticlimactic after the experiences of the past three weeks. I felt that I had seen and done more than enough for one adventure, and I thought it was time I should be getting home to my family. It drizzled in Missoula and continued to rain all the way into Butte. I rode steadily uphill for several miles following an 18-wheel White Western Star toward the Continental Divide. He never got below 70 on the long, steep incline. About 35 miles from Butte, I began to see fresh snow in the fields and on the hillsides, and it got very windy and cold again as I continued to climb toward the divide. The cars coming from the opposite direction were covered with snow, and a short time later I was in another heavy snow squall. I decided to skip Yellowstone and the Beartooth Highway for the same reasons I skipped Idaho. I wouldn't be surprised that the Beartooth Highway was still closed for the season. Snow covered both sides of the road at the divide, and the roads were wet. I ran through more snow, sleet and rain on the eastern slopes, and the sky to the north looked dark and foreboding. I rode through heavy snow showers in Bozeman and Livingston too. They continued all the way into Billings where I stopped for the day at 4:30. I was too cold and tired to continue. I heard that night on TV that a foot of snow eventually fell around the divide. I was glad I got through when I did. I stayed relatively dry underneath my outer clothes, having ridden all day in my rain suit. If I had a face shield, I probably would have ridden for a few more hours, but I had long since discarded the last scuffed up shield when I couldn’t see through it any more. My face took a beating in the crosswinds, especially from the sleet. It was late June at the time. The temperature never got much above 45° all day. Day 22 - The TV reported that a tornado was predicted for South Dakota, which was along my planned route. It looked as though the major part of the storm had passed, but it was still dark in the east. I left at 7 AM with a strong tailwind pushing me out of Billings. The sun came out 15 minutes from the motel and the temperature rose to 50°. It looked like it was going to be a much better day. It was great to finally see the green rolling countryside bathed in sunshine. I rode in cattle country through the Flat Head and Crow Indian Reservations, but I got another two hours of rain and strong winds in the desolate sheep country of northeastern Wyoming. Gasoline was available about every 60 miles. I oiled the chain beneath an overpass because of the rain and strong winds. It was still cool when I entered South Dakota, with occasional sprinkles. A patch of blue showed through once in a while. I saw more blue skies as I crossed the Bad Lands and broke out onto the open prairie. Strong wind gusts from the side threw the bike several feet off course a few times. After covering 660 miles in my rain suit, I checked into a Super 8 in Mitchell, SD and enjoyed my first restaurant meal since leaving Alaska. I chose a Bonanza buffet near the motel. The bike was getting more than 50 miles to the gallon with the tailwinds. After dinner I dressed the points and added a little oil to the engine. Day 23 - I ate a light breakfast in my room and talked later with a guy from Duluth in the parking lot while I packed. He was on his way to California with his wife on a new Suzuki GS750 like mine. He said he had seen me pull in the night before, and he watched from the window that morning until I came out. He told his wife he had to talk with this guy who was in the parking lot with a bike just like his, which looked like it had “really been somewhere”. The bikes were identical, except that mine looked like it had been dragged through a swamp. My clothes didn’t look much better, nor did I. He asked where I had been and seemed amazed as I related some of my experiences of the past three weeks while I continued to load the bike. I rode through another heavy shower about an hour out of Mitchell, after which I saw a spectacular display of nature. I think it was the first time I had ever seen a full bright rainbow. It was huge, very clear, and very bright from end to end, with both ends resting on the ground near the horizons to my right and to my left. This time I was sure it was God saying the arduous part of my adventure was over, and "Welcome home to the lower 48". What an awesome sight! Passing beneath and through the giant arch was another emotional moment for me. A short while later, I stopped to dig out a pair of sunglasses and took off the broken pair of prescription glasses I had been wearing for more than a week. The strong winds didn’t let up yet. Once, when a huge Kenworth 18-wheeler came up from behind, doing about 80, he hesitated before passing when he saw that I was being tossed all over the road by the wind. Most of the countryside I went through that day was farmland. Some of the corn was around 8 feet tall. There wasn't a cloud in the sky in central Iowa. I rode for hundreds of miles without ever losing sight of a cornfield. The wind eventually abated as the day wore on. I stopped at a KFC for dinner around 4:30, and rode for another few hours. I hoped to get within a day of home by nightfall. I spotted a Motel 6 in South Bend, IN where I stopped after 770 miles. Day 24 - I was on the road by 5:30 for my final day. I was anxious to get home. I left before first light. For the first time in more than three weeks I wasn't wearing long johns. After all, it was almost July. It was also the first time since northern Montana that I saw trees on both sides of the highway. There was a serious gypsy-moth infestation in central Pennsylvania where I passed the 10,000-mile point of my trip. I spent most of the day reminiscing many of the incredible experiences of the past 3½ weeks, and making mental notes about how I might improve my next trip. Of the many lessons I learned, the most noteworthy was that I would certainly change the clothes that I take along, and change the kind of motorcycle I'll ride. The reliability of the Suzuki is great, but the ergonomics and carrying capacity leave a lot to be desired. I was convinced that I had to do it again, especially now that Donna is living in Alaska.